Height Adjustable Workstations offer the flexibility to accommodate the needs of different users, creating a comfortable and healthy work environment. Decorative molded side panels hide computer cables for a clean appearance. Durable powder-coated steel frame. The keyboard shelf extends 93 ⁄4" and retracts under the worksurface when not in use. Mobile on four casters (2 locking). Some assembly required. Available in Cherry (CY) and Medium Oak (MO). . 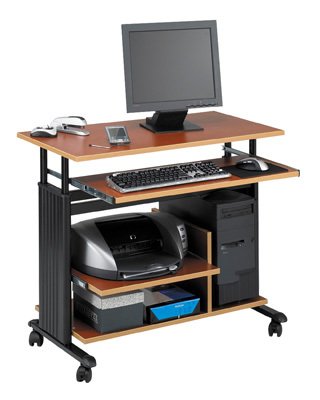 Workstations in 28" and 35" widths adjust from 29" to 34" in height. Features pull-out printer shelf and accommodates CPU up to 16 1⁄2" high. 48"W x 25"D extra large worksurface. Adjusts in height from 35" to 49" for stand-up computer work.